Steph's history is long and checkered. I plan to give an overview of her respective "eras" under various writers. It will be totally biased, and you will either have to deal with that or do your own overviews in addition. For a NON biased overview, see Profile. I want to have some fun! We, the Steph fans, will always be grateful to Chuck Dixon for creating Steph. Chuck introduced Steph as a determined and independent young woman, who saw the wrong in her criminal father's actions and was determined to stop him. 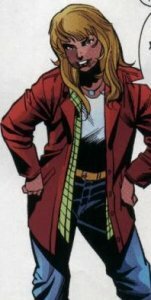 Though she didn't show an attraction to Tim in her Detective Comics debut (in fact, she showed quite an antipathy towards him for finding out her secret identity) when she showed up in his own comic, she quickly developed a crush on him, as any girl in his vicinity is wont to do for whatever reason.